A pleasant drive north from San Francisco to the Russian River Valley wine region offered a whole new perspective on California’s organic wines and their growers. The wineries themselves ranged from rustic to deluxe but the commitment to sustainable wine growing remained a constant. The tasting room at DeLoach Winery. an inviting tasting room and picnic area overseen by a soaring statue appropriately named Earth and Sky. A couple at a picnic table overlooking a charming pond delved in to a special picnic basket which I discovered DeLoach prepares, with notice, featuring an assortment of tasty indulgences presented with elegant linens and stemware and an assortment of delicacies to accompany their wines. Very romantic. 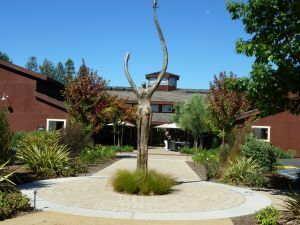 The tasting room, fronted by a patio with umbrella-shaded tables, reflected the casual feel of the Sonoma wine country with its dark wood, weathered rugs and floor to ceiling wine racks. I cozied up to the wine bar and began my sampling of award-winning DeLoach Chardonnay, Pinot Noir and Zinfandels paired with a fine selection of artisan cheeses. This year marks the first vintage of bio dynamically-farmed estate wines at DeLoach Vineyards. DeLoach’s commitment to the environment includes also includes renewable energy sources, cork recycling, water recycling, innovative packaging and the use of recycled building materials. The guest house at DeLoach Winery. surveyed what they call The Guest House. The stunning two story former home of the DeLoach family features an open beamed great room with fireplace, perfect for a yoga retreat or board meeting. This property is available for rental and had been the setting the night before for a wedding with more than 100 chairs spread on the perfectly manicured front lawn. Guests had later retired to the rear of the house for dining and dancing poolside, the surrounding acres of vineyards creating a very private and romantic setting. The guest house offers a memorable venue for corporate meetings, winery dinners, private parties including weddings and mixers. The onsite chef utilizes produce from their organic garden to create stunning menus for any event. DeLoach specializes in wine tastings and wine & food pairing dinners utilizing organic produce grown in their own garden. It is a tasty, healthy, beautiful experience. My next stop took me a short distance down Olivet Road to Inman Family Wines at the Olivet Grange Vineyard. Talk about low-keyed, I drove right past the entrance and had to double back. The signage is scant but the commitment of its owner, Kathleen Inman, is gigantic. Although Inman has been producing wonderful wines and receiving accolades for more than a decade, her tasting room is newly opened. Actually, it is a redwood barn which came with the property. Rather than tear it down and build a more traditional wine tasting room, it was reinvented into a unique and totally green facility. Kathleen Inman greeted me and we adjourned, barn side, to the comfortable umbrella covered patio overlooking the vineyards. While tasting several of her fine Russian River Valley Pinot Noirs and Pinot Gris varieties, she passionately spoke of her philosophy and commitment. This woman not only produces delicious wines but has put her money where her mouth is, literally. We toured the property while Kathleen pointed out Sonoma’s first privately owned public charging station for visitors with electric automobiles in their parking area. I explored the charming and cozy guest house, surrounded by vegetable and flower gardens, offering a private retreat and available for rent. While we walked Kathleen explained that while some luxury wine bottles are oversized and heavy, they have worked to find the lightest possible bottle thus reducing the amount of resources used to make the bottles and requiring less fossil fuel to ship them. Recaptured waste water, roof-mounted solar panels, recycled paper, glass and plastic and even the use of eco-friendly inks all contribute to her commitment to the environment in addition to producing fine wines. Along the wine road, home to more than 160 wineries, I stopped briefly at several other wineries in the Russian River Valley area, just outside the city of Santa Rosa, some more and some less committed to the environment. 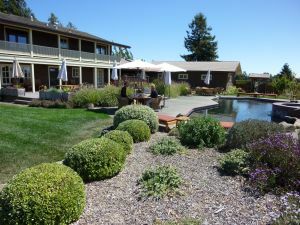 The visit enabled me to taste some exceptional wines, meet some interesting people and enjoy a gorgeous drive through California’s Sonoma County.